From the Baldwin County Courthouse, go east on Hancock St. one block. Turn right (south) on Wayne St. Go 0.9 mile to the Vinson Highway. Turn left on the Vinson Highway (Hwy 112). Go 5.1 miles. 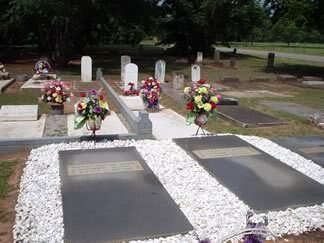 The cemetery is at the intersection of the Vinson Highway and Jesse Scott Rd. 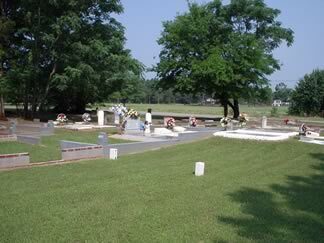 As you face the cemetery, the cemetery was generally surveyed from left to right in rows from the back of the cemetery. The smallest numbered graves are at the back of the cemetery; largest numbered graves are at the front of the cemetery. At least 3 graves -- remnants of a slab and 2 walled or raised granite block graves. He followed virtue As his truest guide, Lived as a Christian, As a Christian died. Death year may be 1899. Last name difficult to read. No dates. w/o D.E. Bland A mother dear from us has gone. A voice we love is stilled. A place is vacant in our home, which never can be filled. w/o Gus Blan, age 57 years. As a wife devoted, As a mother affectionate, As a friend ever kind and true. Name spelled "Blan" but probably "Bland". 3 graves, one marked with a field stone. Father. Death decade difficult to read. No dates. Adult sized slab. Father, son and brother. Gone too soon. Birth day may be Apr 5. Years from survey in 1998. Years no longer visible in 2005. A devoted wife and mother of 12 children. A Hanley funeral home marker. m. Dea. Wm. Mapp Sept 29, 1947.